In a large saucepan, sauté the onion, carrot, potato and celery in butter until tender. Add the flour and seasonings until blended; gradually add milk and broth. Bring to a boil; cook and stir for 2 minutes or until thickened. Stir in turkey and peas; pour mixture into an ungreased pie plate. Unroll the refrigerated pie crust and place over filling. Trim, seal and flute edges; cut slits to vent. Bake at 375° 32 minutes or until golden brown. Let stand for 10 minutes before serving. Serves 4. Brown and crumble ground beef. Drain any excess grease. Add in taco seasoning and water (following directions on back of seasoning packet). Turn off the heat and stir in the salsa con queso. Stir until thoroughly combined. Spray an 8-inch or 9-inch round baking pan with nonstick cooking spray. Layer the bottom of the pan with a flour tortilla. Spread 1/3 of the ground beef taco filling over the tortilla. Cover with 1/3 of the shredded cheese. Repeat 2 more times with the remaining tortillas, ground beef filling, and cheese. Bake at 350 degrees for about 15-20 minutes until cheese is melted and edges are slightly golden brown. Allow to cool for a couple of minutes then slice and serve. Serve with optional toppings such as shredded lettuce, sour cream, salsa, black olives, tomatoes etc. In a large saucepan, combine the first eight ingredients. Bring to a boil. Remove from the heat; stir in the shrimp, sausage and rice. Transfer to a greased 9×13 baking dish. Cover and bake at 375° for 30 minutes. 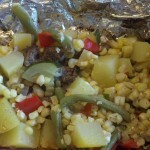 Remove foil and stir; cover and bake 10-15 minutes longer or until rice is tender. Yield: 6 servings. Editor’s Note: The following spices may be substituted for 1 teaspoon Creole seasoning: 1/4 teaspoon each salt, garlic powder and paprika; and a pinch each of dried thyme, ground cumin and cayenne pepper. Nutritional Facts 1-1/3 cups equals 556 calories, 25 g fat (13 g saturated fat), 184 mg cholesterol, 1,345 mg sodium, 57 g carbohydrate, 2 g fiber, 27 g protein. Place crust on an ungreased pizza pan. Brush with oil. Spread beans over crust. Top with beef, tomatoes, jalapenos and cheese. (I serve the jalapenos on the side since I have a small child). Bake at 450° for 10-15 minutes or until cheese is melted. Serve with lettuce, sour cream and salsa if desired. Yield: 6 slices. Nutrition Facts: 1 slice (calculated without optional ingredients) equals 370 calories, 13 g fat (5 g saturated fat), 30 mg cholesterol, 1,103 mg sodium, 46 g carbohydrate, 3 g fiber, 18 g protein. My calculations: 6 servings, 259 calories per slice. I cut into 8 slices and 1/4 of the pizza (or 2 slices) has 389 calories. While your pasta cooks, whisk together the soy sauce, garlic, rice vinegar, sesame oil, Sriracha, and canola oil in a medium bowl. Pour over the cooked noodles and toss so everything gets coated evenly. Garnish with green onions. In a small microwave-safe bowl, combine the soy sauce, sesame oil, honey, Sriracha, ginger root, and garlic. Heat in microwave, medium strength, for 1 minute, then stir. Heat again for 30 seconds. Set aside. Make the kebabs using the chicken, peppers, and onion. Place the skewers in a shallow baking dish and cover with marinade. Cover and refrigerate for 3 hours. (I actually only briefly marinated my skewers and they still turned out great). Preheat your grill. Grill the kebabs at medium-high heat until the chicken is cooked through, turning occasionally, approximately 9-12 minutes. Preheat oven to 425 degrees. Place the pita halves on a baking sheet and bake for 4 minutes. Remove from the oven and cool for 5 minutes. Meanwhile, combine the ricotta, cheeses, garlic, and pesto in a bowl. Spread 1/8 of the mixture over each pita. Bake for 6-7 minutes or until the cheese is melted. Serves 4-8. Each halve has approximately 181 calories…or 361 calories for one pita. Lay out four pieces of heavy duty aluminum foil. Divide the ground beef into four equal portions and crumble a fourth onto the center of each piece of foil. (The original recipe calls for flat patties). Season with sea salt, seasoned salt, pepper, and several dashes of Worcestershire sauce. Top each with 1/4 of the veggies. Season with salt, seasoned salt, pepper, a couple more dashes of Worcestershire, and a drizzle of olive oil. (I used about a teaspoon of oil on each). Fold the ends of the foil together to seal up the packets. Place on a heated grill (medium-high, approximately 450-500 degrees F) and grill for 30-45 minutes…until the potatoes are tender. Remove from grill, place each packet on a plate, and enjoy! Serves 4. Recipe as noted above contains approximately 360 calories per serving. Shred chicken and set aside. In a large bowl, combine the tomatoes, soups, milk and seasonings. Transfer 3-1/2 cups to another bowl; add chicken and cream cheese. Spread 1/4 cup soup mixture into each of two greased 13-in. x 9-in. baking dishes. Place 1/3 cup chicken mixture down the center of each tortilla. Roll up and place seam side down in baking dishes. Pour remaining soup mixture over tops; sprinkle with cheese. Bake one casserole, uncovered, at 350° for 30-35 minutes or until heated through and cheese is melted. Cover and freeze remaining casserole for up to 3 months. To use frozen casserole: Thaw in the refrigerator overnight. Cover and bake at 350° for 45 minutes. Uncover; bake 5-10 minutes longer or until heated through and cheese is melted. Yield: 2 casseroles (5 servings each). Nutrition Facts: 2 enchiladas equals 789 calories, 38 g fat (18 g saturated fat), 129 mg cholesterol, 1,930 mg sodium, 69 g carbohydrate, 3 g fiber, 42 g protein. In a large bowl, combine the bread crumbs, 1/2 cup spaghetti sauce, onion, egg, salt and pepper. Crumble turkey over mixture and mix well. Pat into an ungreased 9-in. x 5-in. loaf pan. Bake, uncovered, at 350° for 1 hour. Spread remaining spaghetti sauce over loaf. Bake 5-10 minutes longer or until a meat thermometer reads 165° and juices run clear. Yield: 6 servings. Nutrition Facts: 1 slice equals 354 calories, 20 g fat (6 g saturated fat), 114 mg cholesterol, 973 mg sodium, 22 g carbohydrate, 2 g fiber, 23 g protein. Note: I recalculated the NI with the ingredients I used and came up with 286 calories per serving.